If you would like to have access to unlimited off-the-grid electricity... or you just want to be prepared in the case of brown-outs, blackouts, or the total failure of our aging power grid due to an EMP attack, then you need to get a solar-powered backup generator pronto! Right now, Solutions from Science offers three different portable solar backup generators, depending on your needs. These solar backups can be used to power lights, appliances, phones, radios, televisions... basically any electrically operated device. 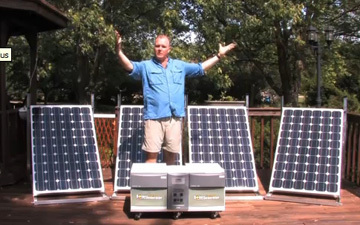 The best part: Once you have one of these solar backup generators, you will have unlimited FREE electricity for the rest of your life! Details: Our most powerful solar backup system.